Loucks consistently puts forth a creative, organized effort to analyze project requirements to achieve client goals in a cost-effective manner. This approach generates multiple alternative site solutions and requires careful analysis to determine best options based on the specific site and client goals. Loucks’ work at Globe Asphalt Shingle Plant and Beacon Bluff illustrates our ability to incorporate innovative grading, utility design and value engineering to generate efficiencies and true cost savings throughout the life of the project. The Globe Asphalt Shingle Plant Demolition in Saint Paul is a $3.1 million project with $745,000 demolition project that removed 135,000 square feet of an asphalt shingle plant and warehouse facility. Loucks and the project team worked with the Minnesota Pollution Control Agency to re-use the concrete and brick as processed granular material for general compactable fill. This allowed up to twelve feet of recycled fill to remain onsite, which otherwise would have been relocated to landfills. The plan saved the Client nearly $500,000 and recycled approximately 90% of the debris, steel, concrete, asphalt, bricks and Douglas fir timbers found at the site. The Beacon Bluff Forest-Phalen Road extended a new road from Forest Street to Phalen Boulevard, providing significant access to the east side of the Beacon Bluff Redevelopment. 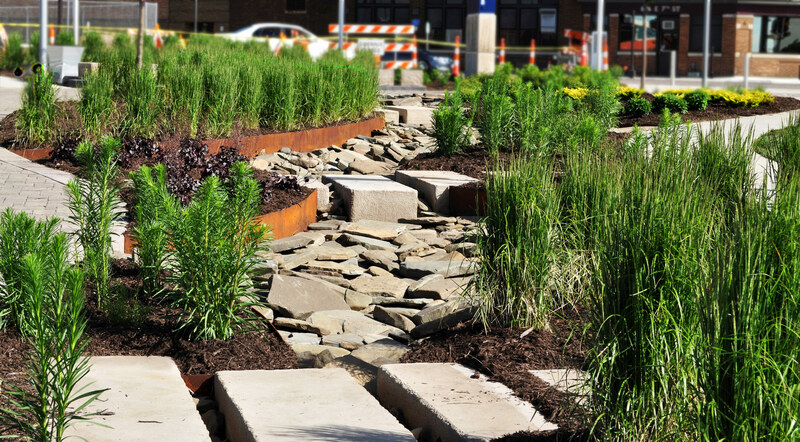 Remnant land was used to create one of the most innovative storm sewer treatment systems in the State of Minnesota. The project required innovative engineering designs to accomplish the owner’s requirement for “green” remediation of environmental contaminants and a “Next Generation” stormwater management system to treat previously untreated stormwater from 163 acres. The system was built with over 650 lineal feet of 10’ diameter perforated CMP, granular bedding, geotextile fabric and shredded tire chips, and included provisions for monitoring ground water recharge and water quality impacts. It is one of the largest underground infiltration systems in Minnesota and was the first known system with separate monitoring locations for acquiring water quality and quantity metrics at various levels beneath the system. This project was also the first time that a University of Minnesota SAFL Baffle was incorporated into a drainage system.